Clay. Late 5th century BCE. Attic. Height: 32 cm. Diameter: 36.2 cm. Vienna, Museum of Art History, Collection of Classical AntiquitiesInv. No. IV 1034. Height: 32 cm. Diameter: 36.2 cm. A palaistra scene. In the centre, a bearded paidotribe wearing a long mantle draped over his left hand. In his hair, he wears a crown of leaves, and in his right hand he is holding a long stick with small, white lateral branches. In front of him, a naked athlete, stepping forward, is swinging two weights in a forward direction. 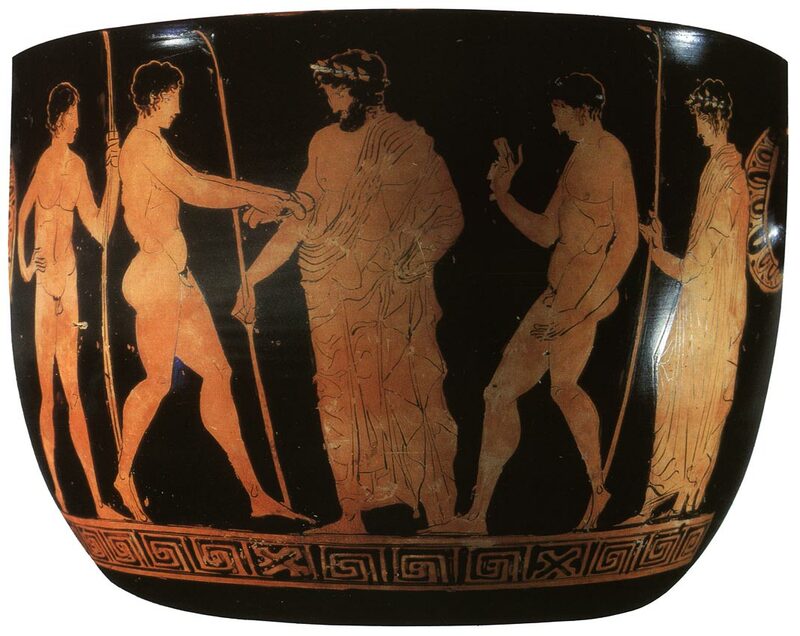 On the extreme left, an athlete, his right hand on his hip and two javelins in his left hand. To the right of the paidotribe, an athlete arrives at a run. On the far right, another young man with a long mantle, a wreath in his hair and a long staff in his right hand. The leaves of the wreath and the staff are white. J. D. Beazley, ARV2 (Oxford, 1963) no. 3 (2) p. 1333; Id., Paralipomena (Oxford, 1971) no. 3 p. 480. F. Eichler, CVA Oesterreich 3, Wien, Kunsthistorisches Museum III (Vienna, 1974) III. 1, pl. 122. 1—4 and p. 24. © 1993. Photo, text: Olympism in antiquity. Olympic Museum Lausanne. Bertelsmann UFA. Industria Gráfica S. A. Barcelona, 1993, p. 95 cat. no. 38. © Photograph — I. Kitbitschka (Kunsthistorisches Museum—Vienna).